Click on the 'Get' button that you see in the image below. You may need to login before continuing. Click the purple 'Add sales channel' button on the next screen. 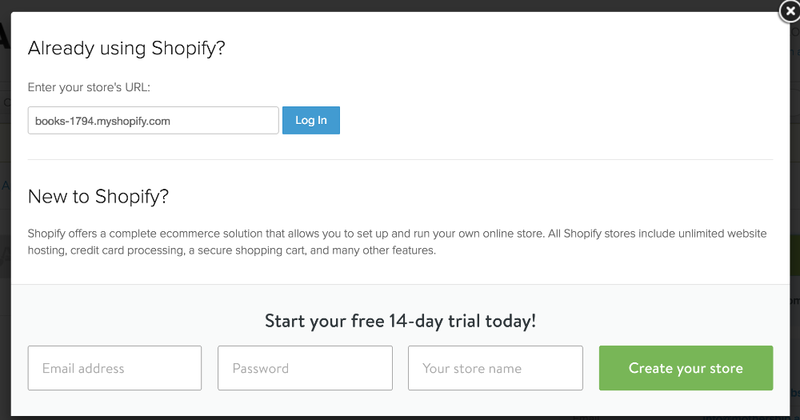 By doing so, you are agreeing to give Mothership access to your store. Mothership will primarily need to access your products and order data. Next, you'll be asked to agree to the subscription fee. Once you agree to the usage fees, you'll be taken to a page where you can read our policy privacy and terms of service. Once you've reviewed and accepted our terms of service, please click the submit button. Next, you should be taken to a screen where you are asked to provide an email address. Mothership will communicate with you about events that take place in your store via email. This should be a monitored email address because you may receive updates that require you to take action related to a retailer's order. On the next page, you'll set up your first catalog. 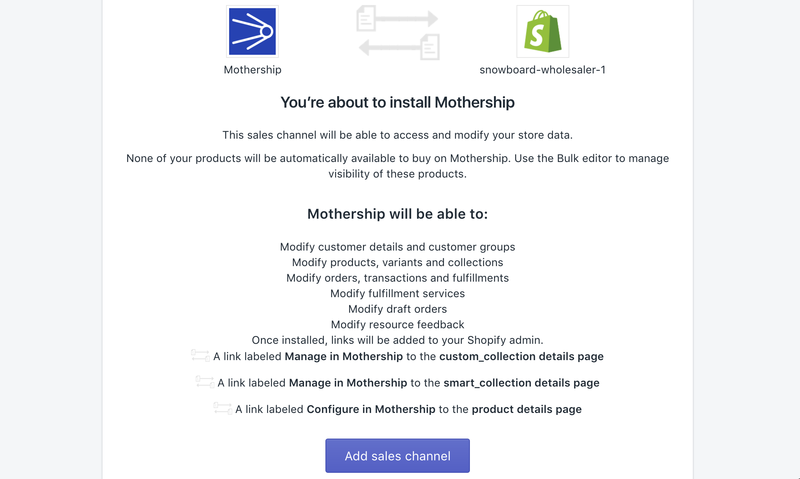 Mothership organizes products that you publish to retailers into catalogs. You can use catalogs to offer products to one group of retailers, but not others. You can also use catalogs to offer different margins on pricing to retailers. A product can belong to more than one catalog, but a retailer can only subscribe to one of your catalogs. Next, you'll be asked to review your shipping settings. 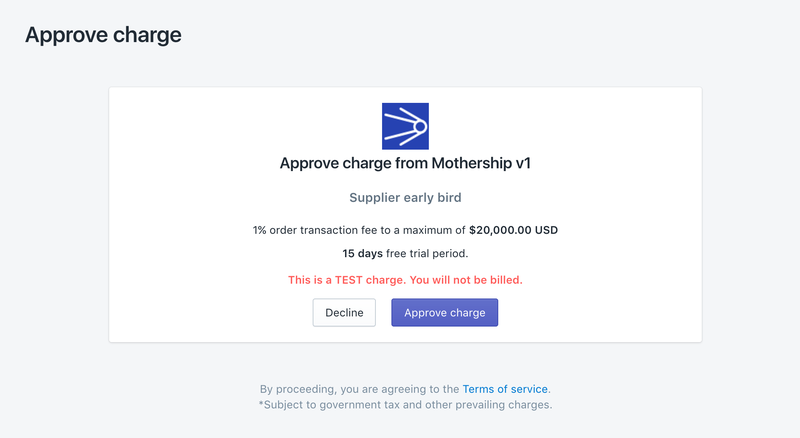 Mothership will import your shipping zones from Shopify and any shipping rates you have defined. If you do not have shipping rates defined, you will need to set them up prior to accepting orders from retailers. Once you're ready, click the 'Continue setup' button at the top. Next, a quick disclaimer about taxes. Drop shipping can have important sales tax consequences and you'll want to be prepared. If you live in the US, this generally means you need to collect a tax exemption certificate from your retailers for the jurisdictions where you have a nexus. You should consult with a tax professional to ensure that you meet all of your obligations. And we're done setting up Mothership. Next, you'll want to go over how to publish/unpublish products and collections to Mothership. 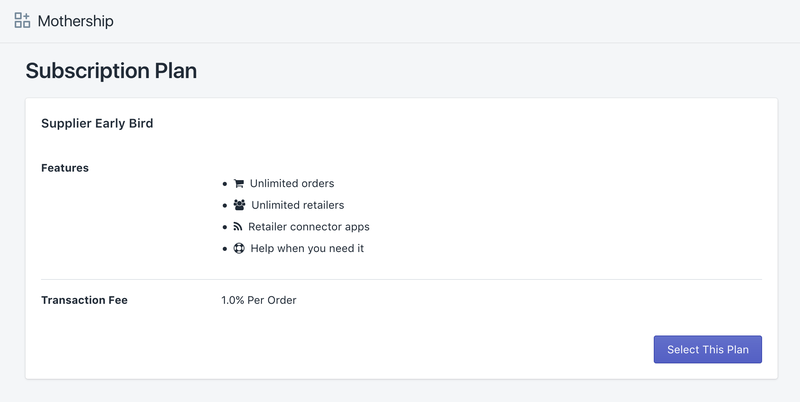 You'll also want to explore how to set custom pricing for products by catalog. When you're ready to start selling to retailers, you'll need to setup a marketplace listing.